261 Hope Street, Glasgow. G1. Tell:. 0141 331 1886. The Gap was better known in the 1980s as the French Quarter. Now Called the Boogie Bar. 2007. 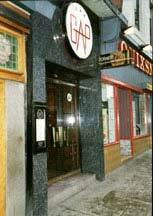 Opened in 2000, a nice gay friendly bar. This was originally the Rialto during the 1970s. 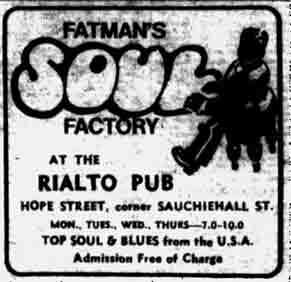 One of the "in" places these days in Glasgow is the Rialto in Hope Street, and one of the reasons is the tremendous popularity of entertainer Jim Brannigan. Jim, who plays eight instruments, organ, guitar, clarinet, saxophone, vibes, banjo, bass and steel guitar, has a completely individual style. He can best be discribed as a modern jazz soloist and plays a mixture of Burt Bacharach and Nat King Cole. Jim is on stage at the Rialto on Wednesday and at their dinner-dance on Friday and Saturdays. At present Wednesday night is talent contest night at the Rialto. I was along this week and it was a lot of fun. Incidentally owner Leonard Rossi gets on stage most nights and belts out a few numbers, and he sings well too. On the night I was in, he got a tremendous round of applause. I couldn't make up my mind wheather it was because they enjoyed it so much or wheather they were afraid of being barred it they didn't!